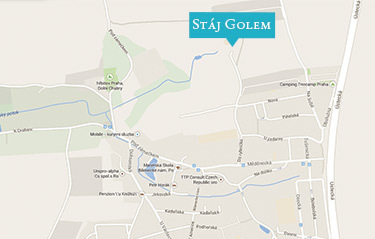 Golem Sport Stable facilities include 34 individual box stalls. Ten of them are housed in a stable with large windows providing sufficient ventilation and an all-day view for the horses of all that is happening outside. The stable has its own tack room and wash box. More stalls are outside around an open yard. Each box is equipped with a feeder, an automatic waterer, and a salt block holder. Tack is stored in a “barn” where you can also tie, groom, and saddle your horse. Horses are turned out daily into several hectares of grassy paddocks surrounding the Stable. The Draháň Natural Park in our vicinity provides ample possibilities for beautiful and safe rides on dirt roads and through forests. Horses are standing on dust-free wheat straw pellets.